The Tunnels - Showcase night. Bands/Ensembles/Soloists wanted. 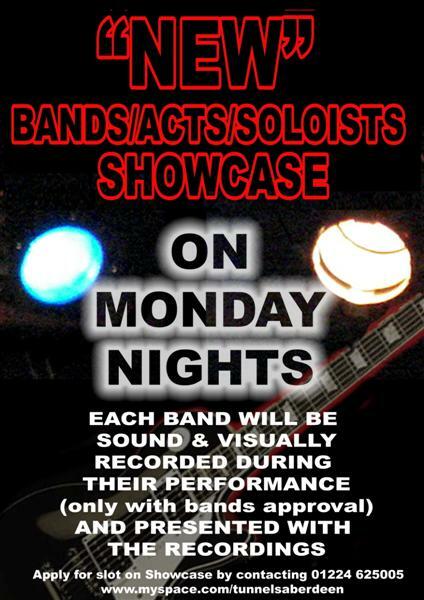 The Tunnels are starting a new Showcase Night that will be starting in the middle of April. We are looking for new acts from Aberdeen and Grampian to perform at our Showcase night. We welcome artists, ensembles and bands in any style and any genre. Want to play a trumpet concerto? Or perhaps some out-there electronic music? Go for it! We want to hear from everybody!! The artists will receive copies of professional audio and video recordings of their performance. The recordings are for you to keep, and you are free to use it for your future publicity. All entrants should contact The Tunnels via the myspace page: MySpace.com - THE TUNNELS - 102 - Male - UK - www.myspace.com/tunnelsaberdeen. ****DISCLAIMER**** I now work as an Event Manager for The Tunnels. I dont wanna seem stupid but, why does the poster say Drummonds? I know The Tunnels run / own Drummonds, but still?